Cricket! I don’t like cricket…oh no…I hate it! 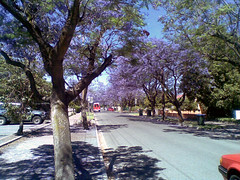 I do love the Jacaranda trees at this time of year too, the mess isn’t so great though. I love the fruit in Summer! Not much that I hate about it – one of my favourite seasons (because you can always cool down with a shower or swim). Melbourne is also sweltering – that is if you’re somewhere other than Melbourne, otherwise you already know that anyway. Yes it looks like another long hot summer is looming.